Electroacoustic trio Ergo was formed in the early 2000s by New York-based trombonist Brett Sroka, who was inspired by the seamless blend of electronics and more traditional instrumentation featured on Radiohead’s 2000 album Kid A. After the 2006 release of their debut, Quality Anatomechanical Music Since 2005, original drummer Damion Reid was replaced by Shawn Baltazor, while current keyboardist Sam Harris (who replaced Carl Maguire) joined in 2010. Ergo have been signed to Cuneiform Records since their second album, multitude, solitude (2009), and have performed at a number of on avant-garde music festivals, such as Washington DC’ Sonic Circuits – where they will be appearing again in September 2012. 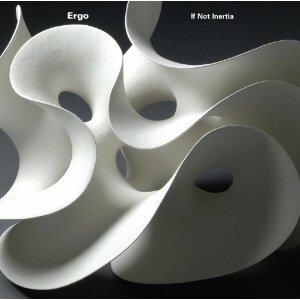 The sinuous curves rendered in minimalistic black and white of the artwork (titled “Loop in Layers”) that graces the cover of If Not Inertia, Ergo’s third CD release, come across almost as a statement of intent. Indeed, the band’s sound hinges on the use of loops and a wide range of other electronic effects, controlled by Sroka’s trusted computer, which mesh with the warm, organic tones of the trombone, drums and piano. Ambient, avant-garde and free jazz mingle in seven tracks that offer dissonant patterns underpinned by insistent drones, and some unexpected snippets of skewed melody that temper the austerely rarefied quality of the music. The seven compositions included on If Not Inertia range from the 5 minutes of opener “Sorrows of the Moon” to the almost 12 minutes of “Little Shadow”, for a total running time of around 50 minutes. Some of the tracks offer intriguing sonic renditions of celebrated literary works in a way that – while markedly different from the grandiose approach of the average progressive rock band – undeniably makes for an arresting listening experience. The three band members are supplemented by renowned avant-garde guitarist Mary Halvorson (guesting on three tracks) and acoustic guitarist Sebastian Kruger on one track. If Not Inertia is an album of light and shade, made of sounds that possess a somewhat brittle quality, like glass that is about to break. The main instruments often seem to be playing different lines, which nevertheless coalesce to create a texture reminiscent of an abstract painting, at the same time ethereal and intensely expressive. “Sorrows of the Moon” recreates the Baudelaire poem of the same name in melancholy, haunting fashion, depicting its inherent languor and ennui through the mournful voice of the trombone and a droning piano line overlaid by almost melodic guitar. “The Widening Gyre”, inspired by William Butler Yeats’ iconic poem “The Second Coming”, like the titular item starts out slowly with measured drums and gentle piano, then erupts into trombone-led chaos that conveys the poem’s stark, powerful imagery (“Things fall apart; the centre cannot hold/ Mere anarchy is loosed upon the world”). While “Two for Joy” and the title-track rely on plenty of sound effects (such as whistling) to weave an ethereal yet slightly spooky atmosphere, the buoyant trombone in closing track “Let’s” is almost catchy, bolstered by drums, piano and lilting acoustic guitar. If Not Inertia will delight lovers of ambient and experimental jazz, as well as those with a keen interest in the use of computers for music-making. This is an album for adventurous listeners, and those with a high tolerance for dissonance and the lack of a recognizable structure – which means it may be of somewhat limited interest for the traditional prog fan. On the other hand, open-minded music buffs will find it a challenging but rewarding listen. ERGO sounds right up my alley. I’m always curious to hear new Cuneiform releases. Have a great day, my friend…I am now going to the web to seek out ERGO. I can tell by the way you have described the music, that I’m going to like this. Thank you, Jason! Getting ready for NEARfest tomorrow! This sounds intriguing … time to check out some new tunes! Thank you for the kind words! I hope you will discover some more great music through my scribblings. This is a stunning find … great music! !